The Massachusetts Task Force 1 urban search and rescue team demonstrated search-and-rescue techniques at its Beverly headquarters and training site to promote "RESCUE," a new documentary filmed in 3D that will play at the Mugar Omni Theater at the Museum of Science in Boston. 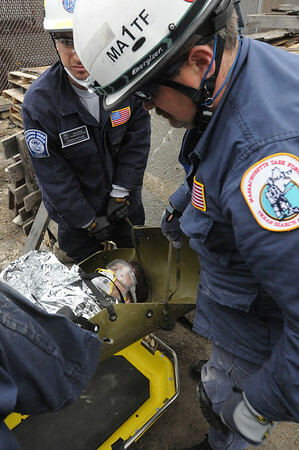 The victim, Amanda Leck, is taken out from under the rubble through a cut hole in concrete. Photo by Ken Yuszkus/Salem News, Tuesday, June 14, 2011.